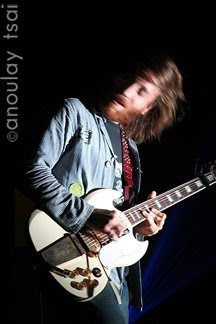 My very favorite photo of Dan Auerbach, by Anoulay Tsai, Sept. 2006. Read any interview with Dan Auerbach, and you'll find that he's not a fan of the term “blues.” But listen to any Black Keys record, and try to note his finest recorded moments without applying that term – at his absolute best, Auerbach's usually leading a deep, bluesy ballad or filling in Pat Carney's hard, choppy beats with guitar work simultaneously raucous and fluid. All the while, he'll make you melt with a voice that's warm, rich and smooth. He's pure heaven, and he's tremendously easy to fall in love with on first listen. As a duo, the Black Keys manage never to fully repeat themselves yet have a consistent style that works beautifully with each release – playful beats to back up streams of full, bent notes, even when covering artists like the Kinks or Junior Kimbrough, and Auerbach's familiar bark gushing all over the place. That in mind, it's somewhat of a dilemma that Attack and Release is by far the most experimental record they've got, completely burying Auerbach's voice under songs marked more deeply with the signature stamp of Danger Mouse's clean production than the Keys' uncluttered blues rock, and yet, still a relevant record that likely wouldn't work if performed by a different band. I miss Pat Carney's “medium fidelity” recordings, and I'd kill for one more long, drawn out blues number. But they've made an excellent effort at not repeating themselves, and for them, the experimentation works, even if these songs were meant for Ike Turner and not themselves. That this is the first album not produced by the band itself is quickly apparent. There's a lot of production work on this record, Attack and Release marked by slight hip-hop-style enhancements to Carney's drumming, helping the record roll forward and fit more cleanly into the realm of indie territory than usual. Likewise, there're some ghostly choruses added beneath layers of acoustic guitar, a combination which offers an urban-bluegrass vibe in places like “Psychotic Girl,” and for the first time, a number of guest appearances, including one by 18-year old bluegrass singer Jessica Lea Mayfield. “Lies” is the best of all, though, gorgeous and much closer to the typical blues ballad that seems to pop up on each Black Keys release, highlighting Auerbach's chocolate pudding serenade. Taste each of their records and then buy a copy of Attack and Release, even if it did leak to the point where every blogger on the planet has written a review and posted every track for free. It's a really great album. I'm glad you liked it. James - I do think Danger Mouse is an interesting producer, and I like what he's done with the album, but I'm still getting used to it, too. I was fascinated by this album that wasn't a repeat of former Black Keys albums, but a big part of me also loves what they're best at, you know? In agreement that Magic Potion probably wasn't their best, though.